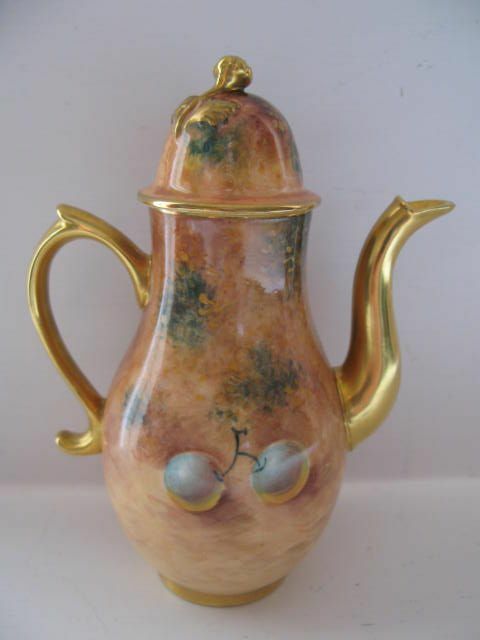 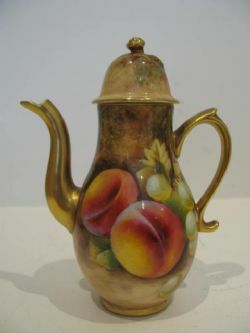 A Royal Worcester Fruit Painted Miniature Coffee Pot By Roberts. 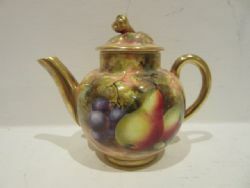 A Royal Worcester miniature coffee pot decorated with well painted apples and black grapes against a mossy background by William Roberts. 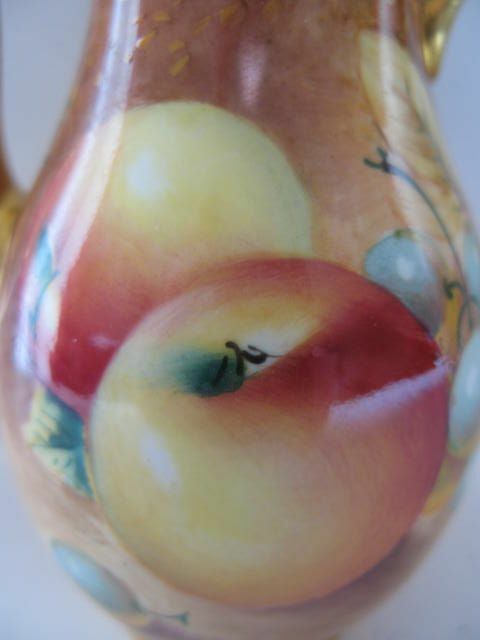 Standing approximately 5"tall to the top of the finial x 3.1/2" wide over the handle and spout, it has the black factory stamp for 1952 and is in very good condition with no damage, crazing or restoration and the gilding is bright and virtually without wear. A miniature Royal Worcester porcelain coffee pot, with well painted fruit decoration by William Roberts. 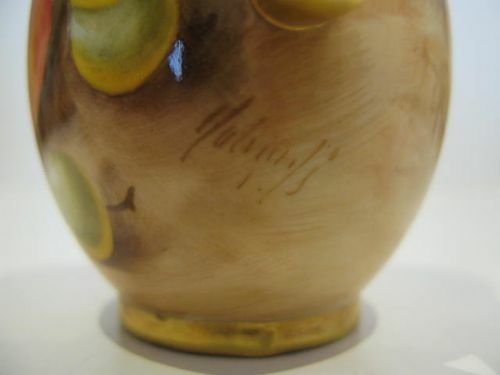 Standing approximately 3.3/4"wide x 5"high, it has the black factory stamp for 1954 and is in excellent condition with no damage, crazing or restoration and the gilding is bright and without wear. 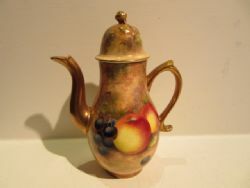 A Royal Worcester porcelain miniature coffee pot, with fruit painted decoration by William Roberts. 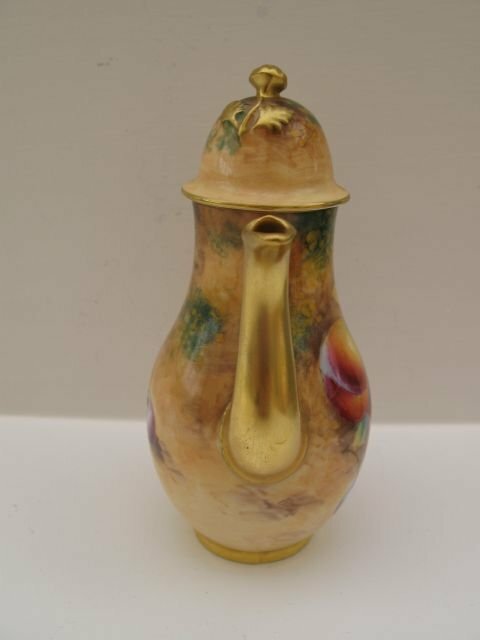 Standing approximately 5"high to the top of the finial x 3.1/2"wide from tip of spout to tip of handle, it has the black factory stamp for circa 1975 and is in excellent condition with no damage, crazing or restoration, and the gilding is fresh and unworn. 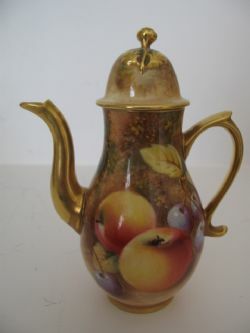 A Royal Worcester porcelain miniature coffee pot, with fruit painted decoration by William Roberts. 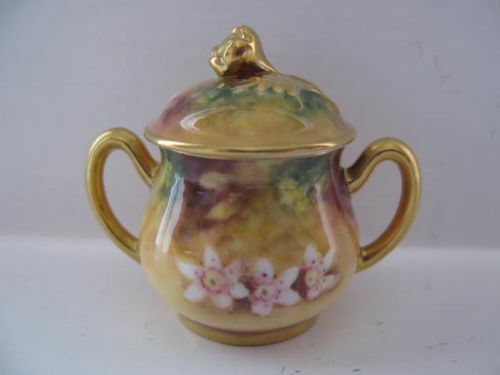 Standing approximately 4.3/4"tall x 3.3/4"overall width, it has the black factory stamp for circa 1970 and is in excellent condition with no damage, crazing or restoration, and the gilding is bright and without wear. A good, Royal Worcester porcelain miniature coffee pot, with nicely painted fruit decoration by William Roberts. Standing approximately 5"overall height x 3.3/4"overall width, it has the black factory stamp for circa 1975 and is in excellent condition with no damage, crazing or restoration and the gilding is bright and without wear. 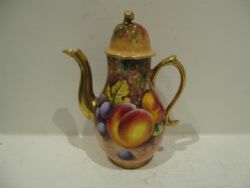 A Royal Worcester Fruit Painted Miniature Coffee Pot. 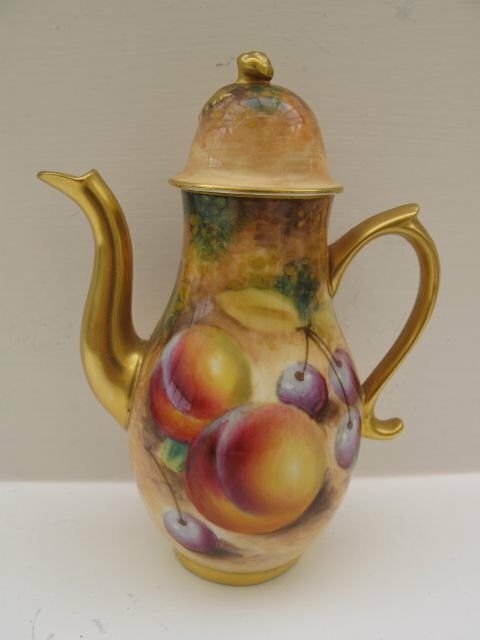 A Royal Worcester porcelain miniature coffee pot, with painted fruit decoration by William Roberts. 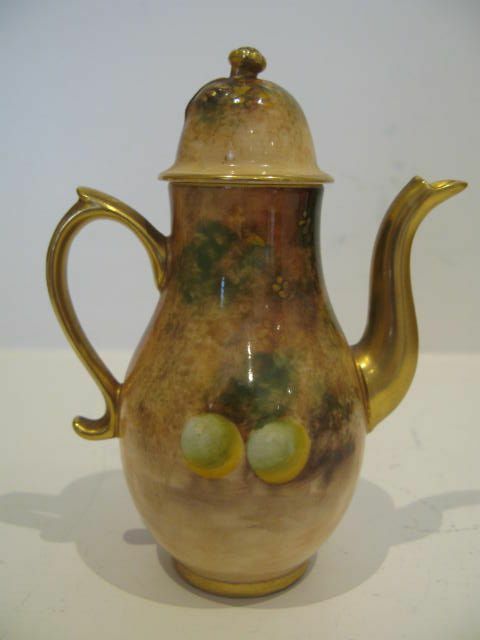 Standing approximately 5"tall x 3.1/2"wide over the handle and spout, it has the black factory stamp for 1958 and is in excellent condition with no damage, crazing or restoration and the gilding is bright and without wear. 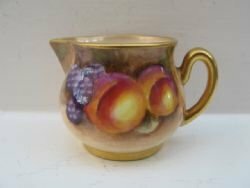 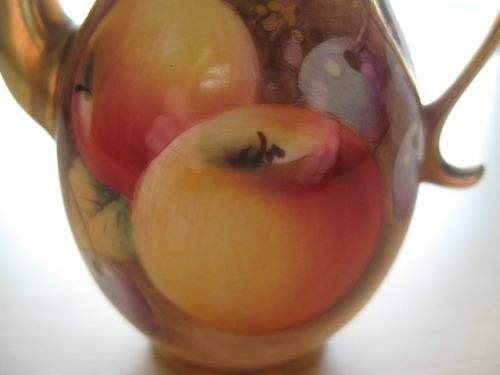 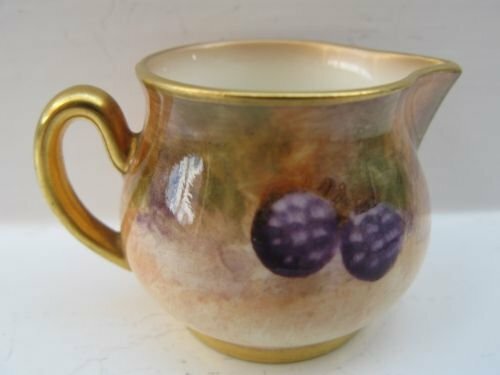 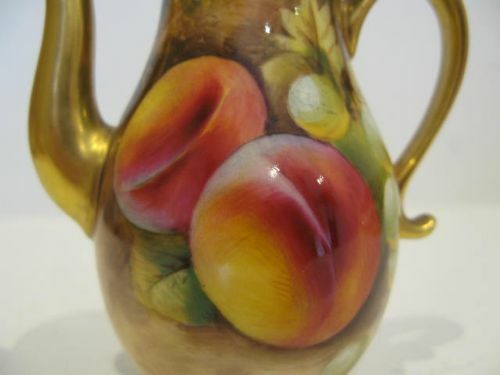 A Royal Worcester Fruit Painted Miniature Cream Jug by W. Roberts. 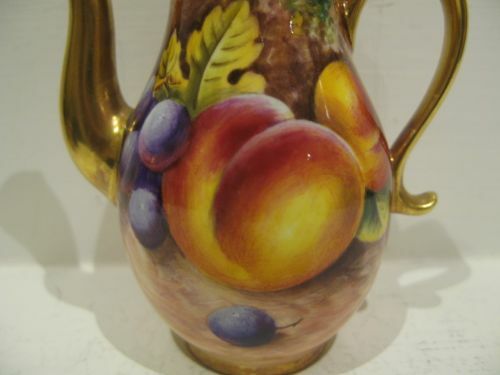 A Royal Worcester porcelain miniature cream jug, with fruit painted decoration by William Roberts. 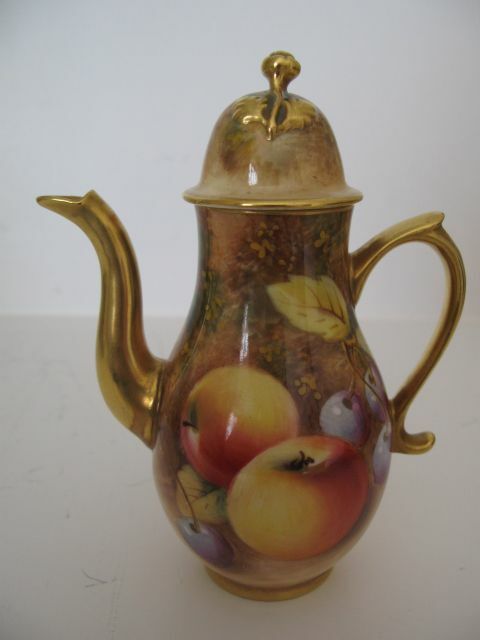 Standing approximately 2"long from handle to tip of spout x 1.1/4"high, it has the black factory stamp for 1954 and is in excellent condition with no damage, crazing or restoration, and the gilding is fresh and unworn. 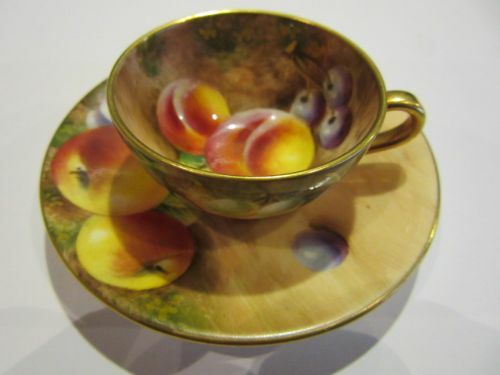 A Royal Worcester Fruit Painted Miniature Cup And Saucer By Roberts. 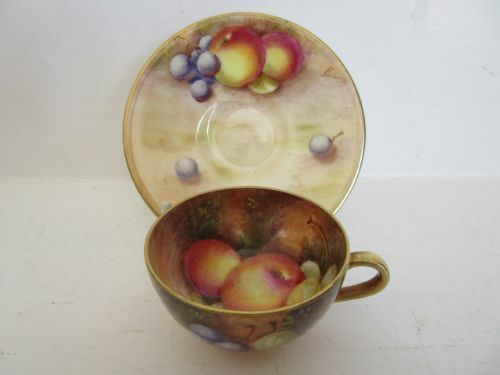 A Royal Worcester porcelain miniature cup and saucer, decorated with well painted apples, green grapes and purple grapes against a mossy background by William Roberts. 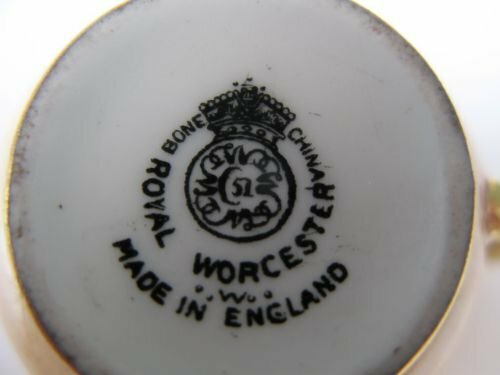 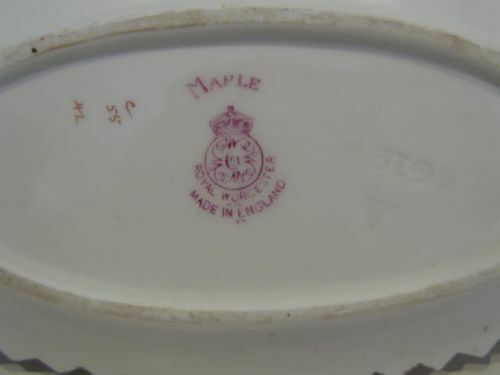 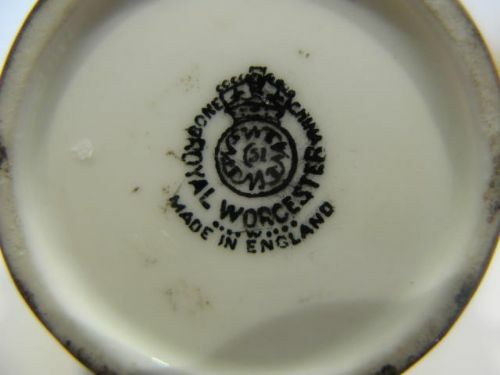 The saucer measures approximately 3.3/8"diameter x 1/2"deep and the cup 2"diameter x 1.1/8"deep, and they have the black factory stamps for 1952 and 1954 respectively. 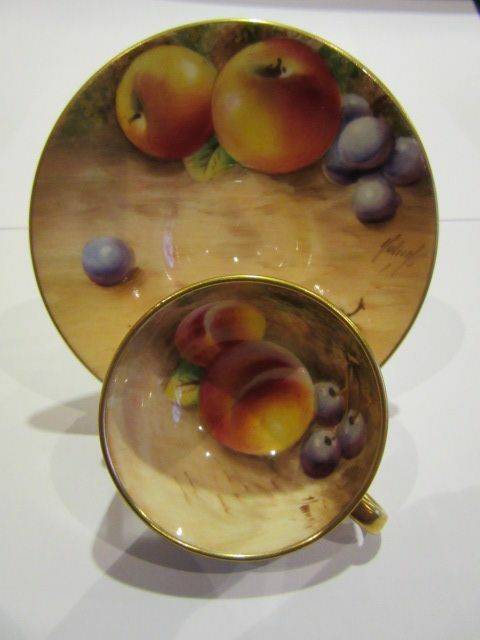 They are both in very good condition with no damage, crazing or restoration and their gilding is bright and virtually without wear. 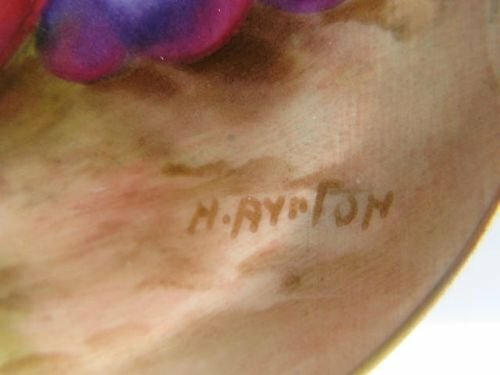 A Royal Worcester Fruit Painted Miniature Plate By H. Ayrton. A good, Royal Worcester porcelain miniature plate, with nicely painted fruit decoration by Harry Ayrton. 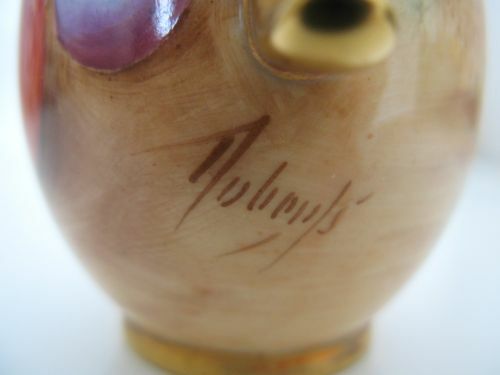 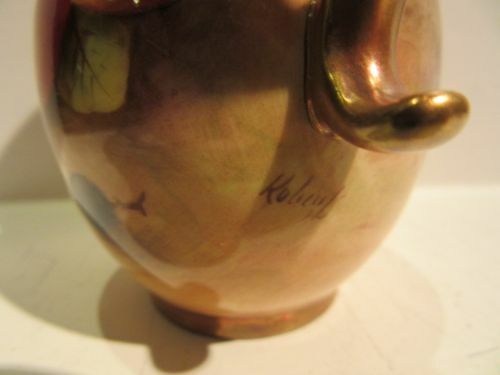 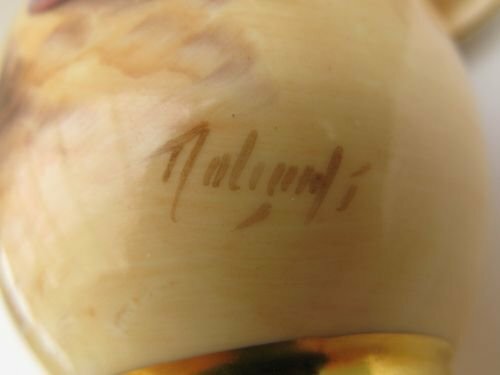 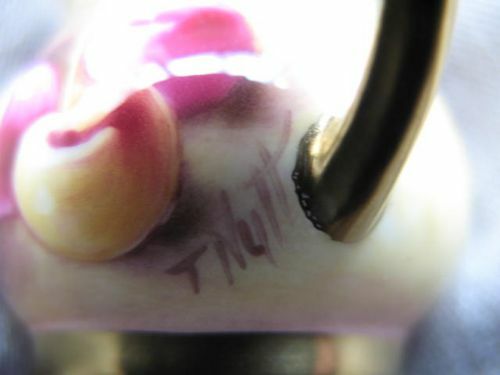 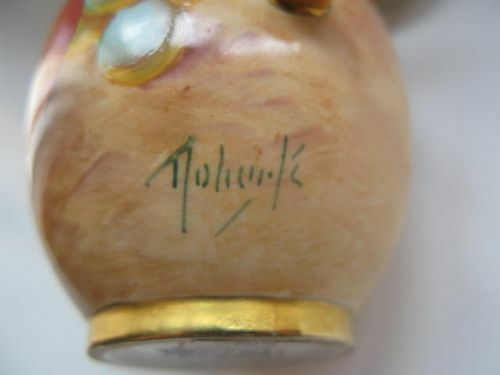 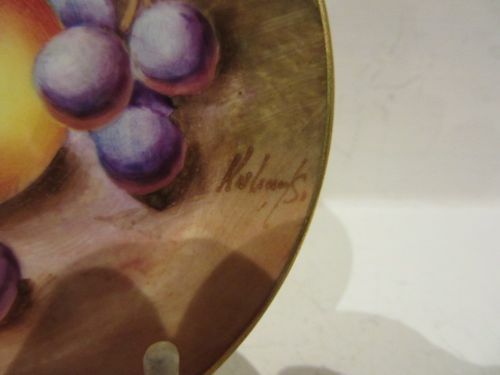 Measuring 3.3/8" diameter, with the puce factory stamp for 1939, it is in very good condition with no damage, crazing or restoration, and the gilding has no wear or rubbing. 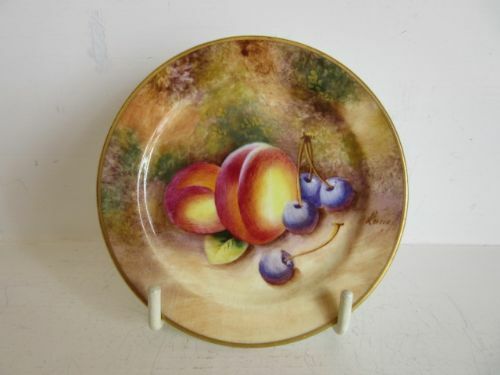 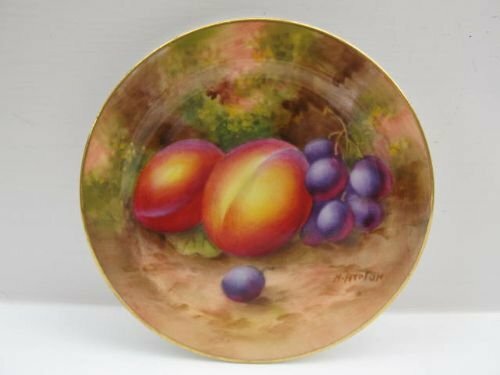 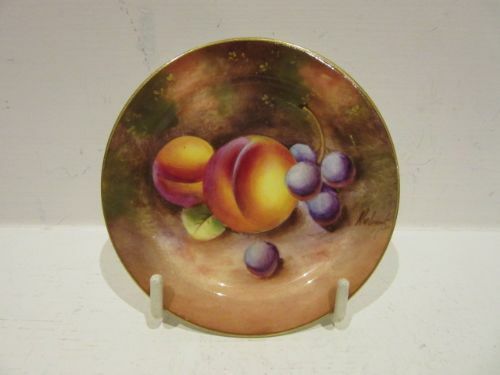 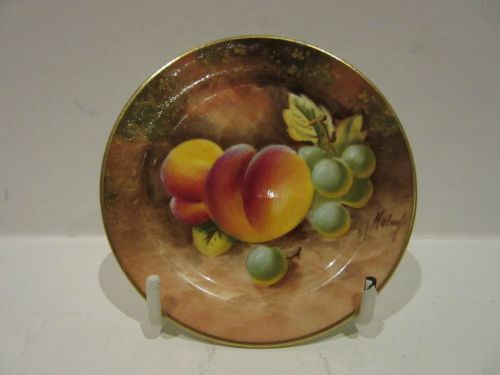 A Royal Worcester Fruit Painted Miniature Plate By Roberts. 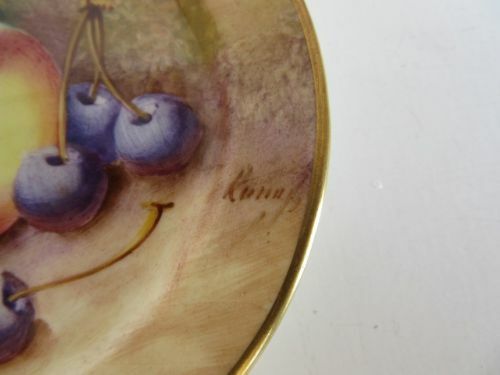 A Royal Worcester porcelain miniature plate, with nicely painted plums and damsons against a mossy background by William Roberts. 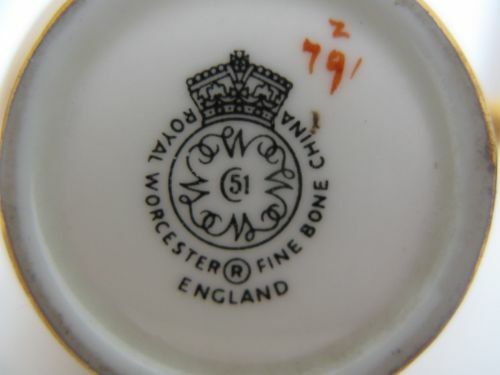 Measuring approximately 3.1/2"diameter, it has the black factory stamp for 1954 and is in excellent condition with no damage, crazing or restoration and the gilding is bright and virtually without wear. 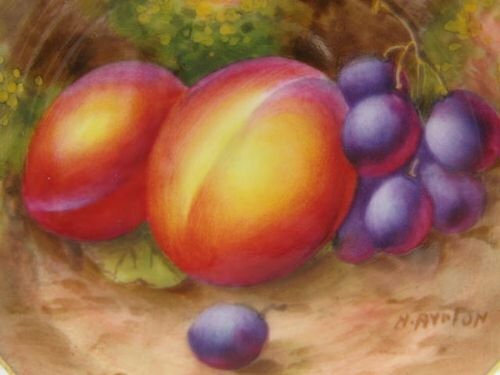 A Royal Worcester porcelain miniature plate, decorated with well painted plums and purple grapes against a mossy background by William Roberts. 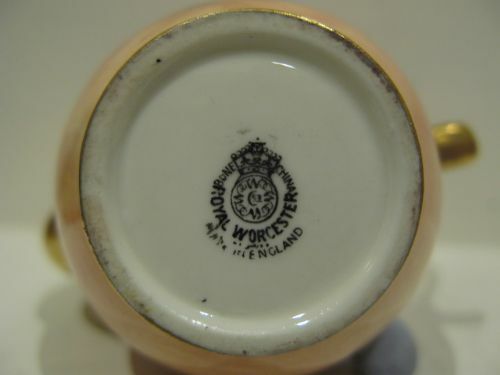 Measuring approximately 3.1/2"diameter x 3/8"deep, it has the black factory stamp for 1952 and is in very good condition with no damage, crazing or restoration and the gilding is bright and virtually without wear. 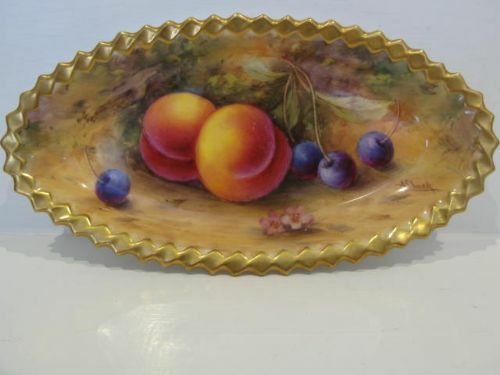 A Royal Worcester Fruit Painted Miniature Plate, 1955. 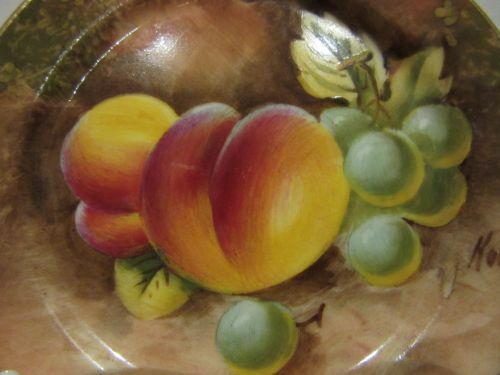 A Royal Worcester porcelain miniature plate, with painted fruit decoration by William Roberts. 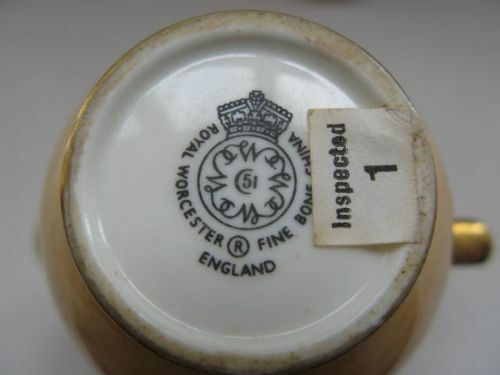 Measuring approximately 3.3/8"diameter x 3/8"deep, it has the black factory stamp for 1955 and is in excellent condition with no damage, crazing or restoration and the gilding is bright and virtually without wear. 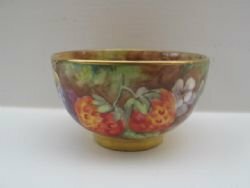 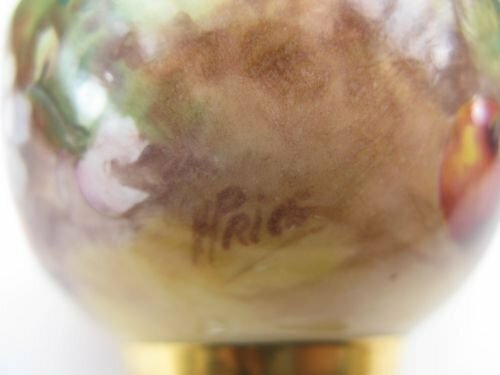 A Royal Worcester Fruit Painted Miniature Sugar Bowl By H Price. 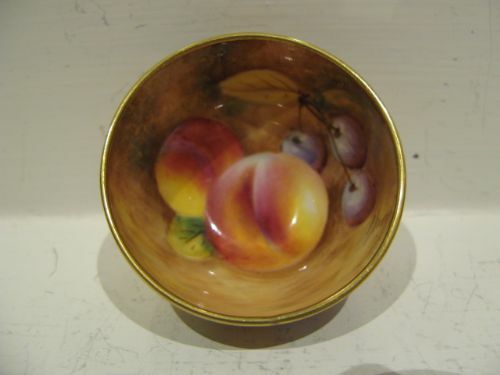 A Royal Worcester porcelain miniature sugar bowl,with beautifully painted fruit decoration by Horace Price. 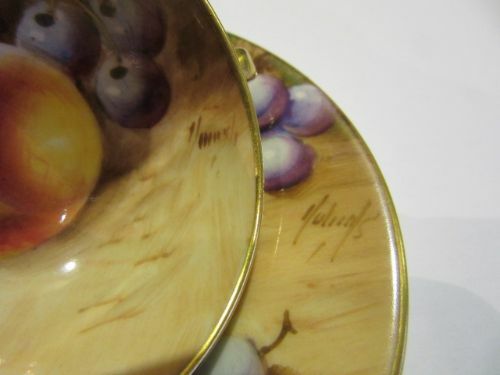 Standing approximately 2.1/4"diameter x 1.3/8"high, it has the dark blue factory stamp for 1939 and is in excellent condition with no damage, crazing or restoration, and the gilding is fresh and without wear. 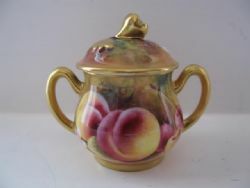 A Royal Worcester Fruit Painted Miniature Sugar Bowl By Roberts. 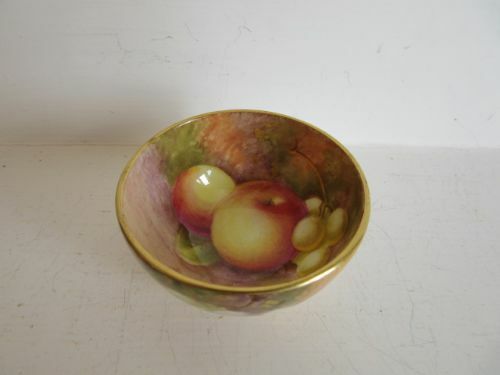 A Royal Worcester porcelain miniature sugar bowl, with well painted apples and grapes against a mossy background inside and out by William Roberts. 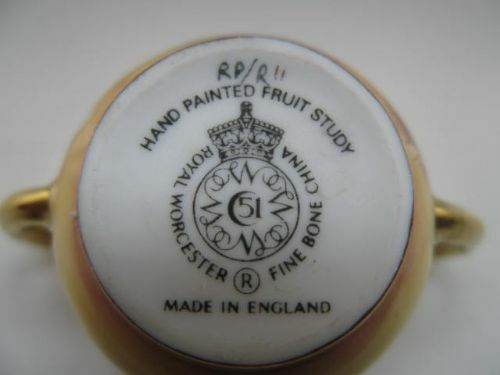 Measuring approximately 2"diameter x 1.1/8"deep, it has the black factory stamp for 1952 and is in very good condition with no damage, crazing or restoration and the gilding is bright and virtually without wear. 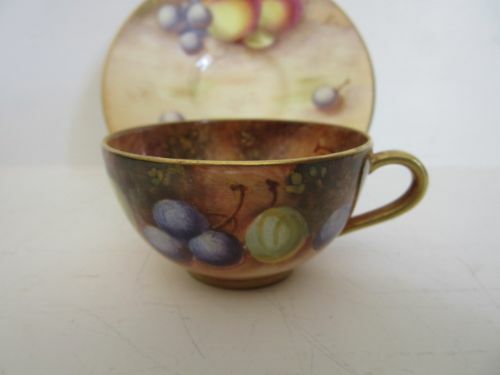 A miniature Royal Worcester porcelain sugar bowl, with well painted fruit decoration by William Roberts. 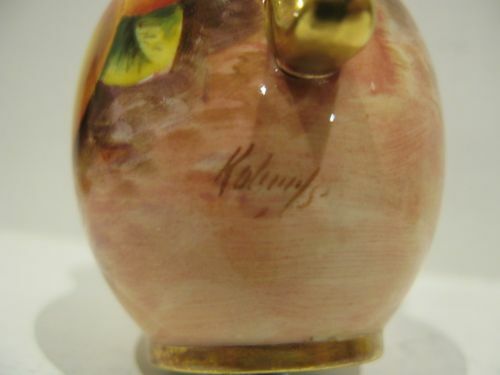 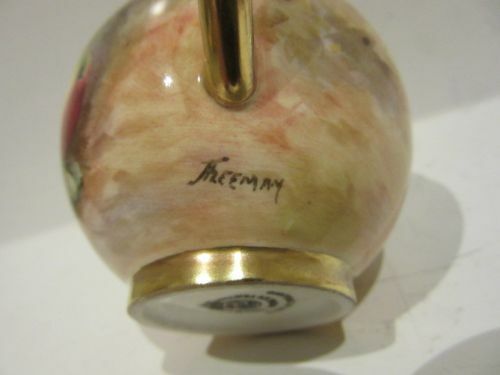 Measuring approximately 2"diameter x 1.1/8"tall, it has the black factory stamp for circa 1970 and is in excellent condition with no damage, crazing or restoration and the gilding is bright and without wear. 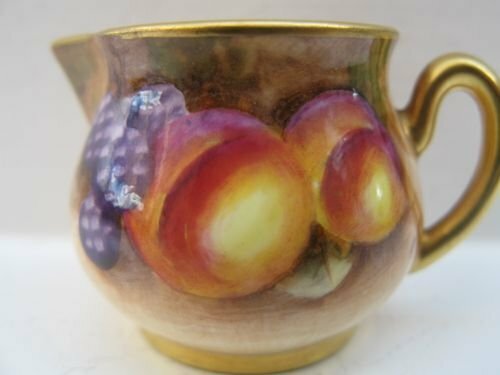 A Royal Worcester Fruit Painted Miniature Sugar Bowl By T. Nutt. 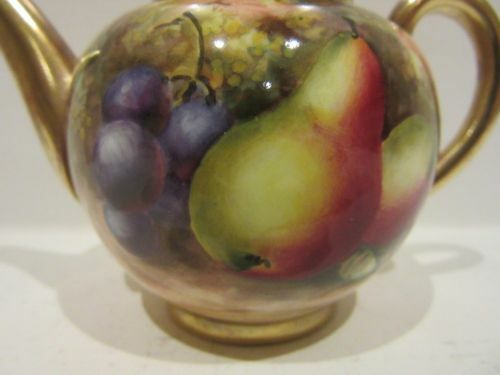 A Royal Worcester porcelain miniature sugar bowl and cover, with fruit painted decoration by Terrence Nutt. 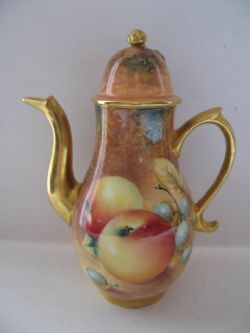 Standing approximately 2.1/2"overall width x 2"high, it has the black factory stamp for circa 1985 and is in excellent condition with no damage, crazing or restoration, and the gilding is in immaculate condition. 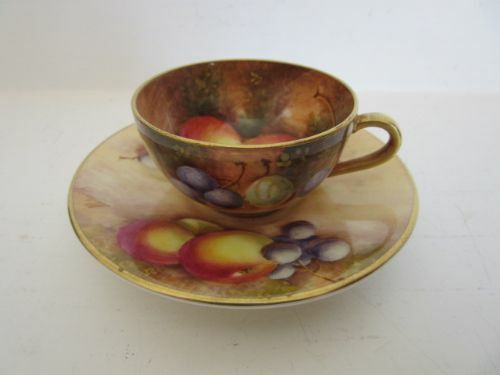 A Royal Worcester Fruit Painted Miniature Teacup And Saucer. 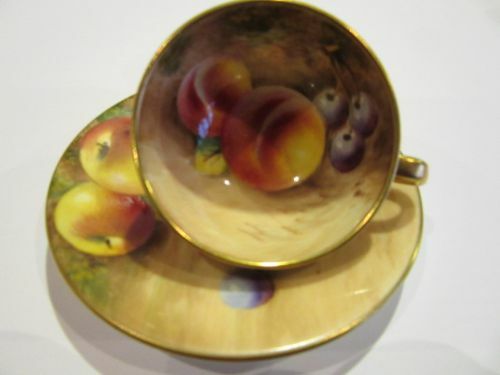 A good Royal Worcester porcelain miniature teacup and saucer, with well painted ripe fruit against a mossy background by William Roberts. 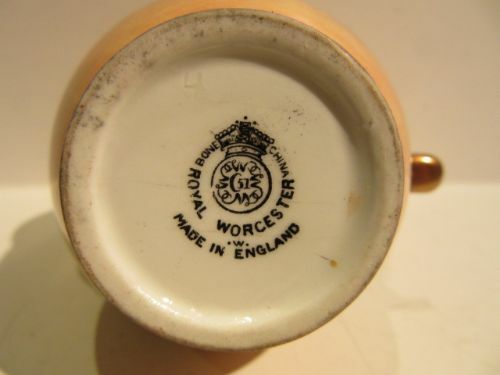 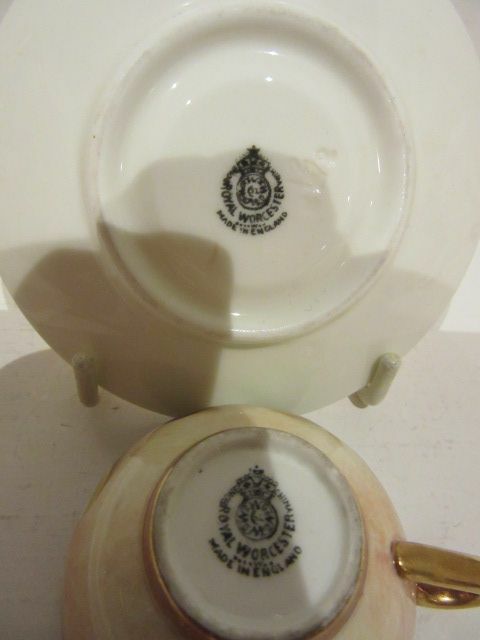 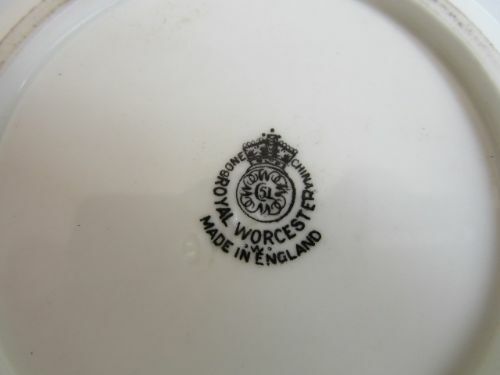 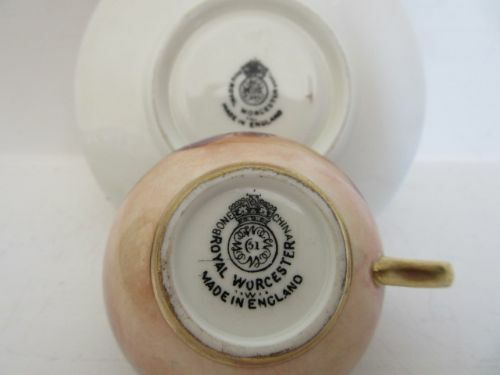 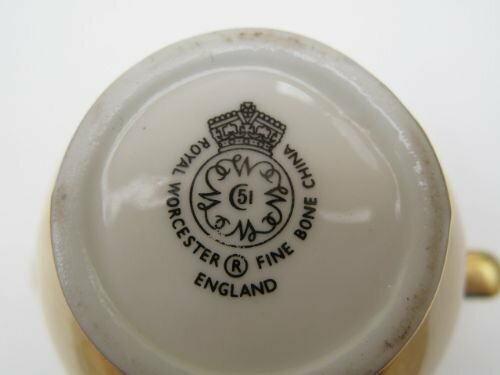 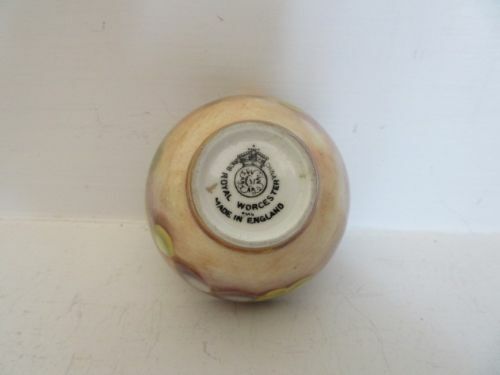 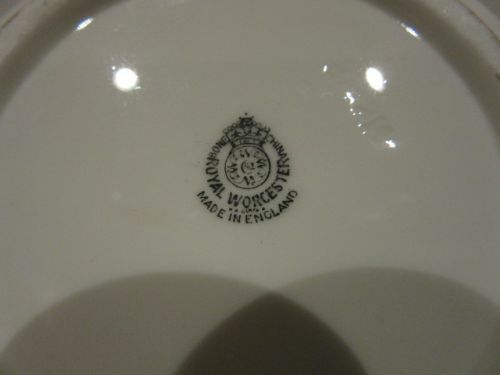 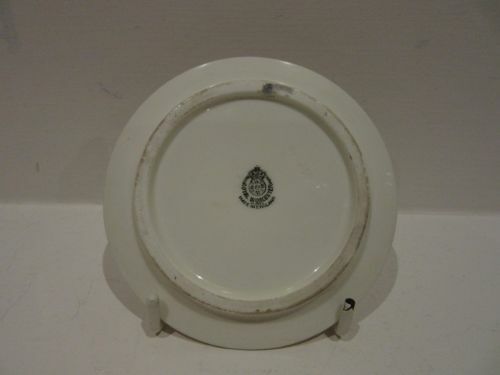 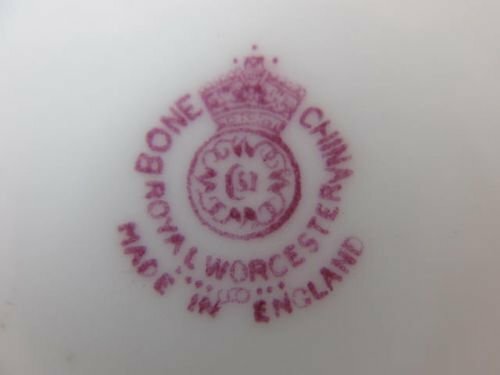 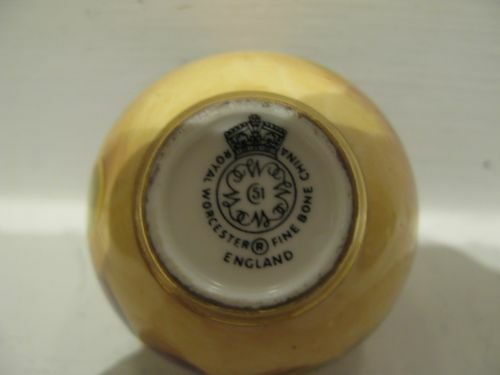 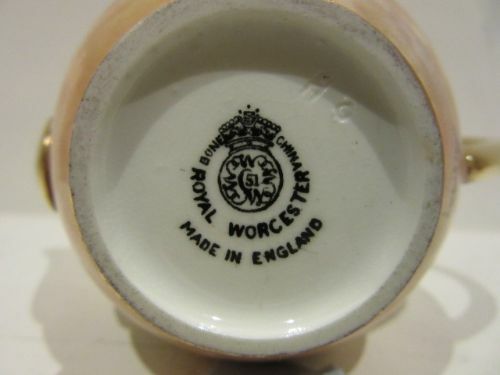 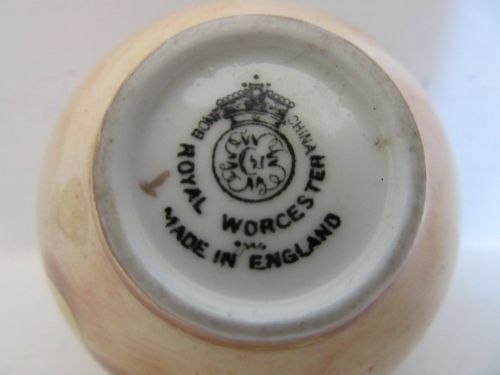 The cup measures 2"diameter x 1"tall excluding the handle, and the saucer is 3.1/4"diameter, with both having the black factory stamp for 1956. 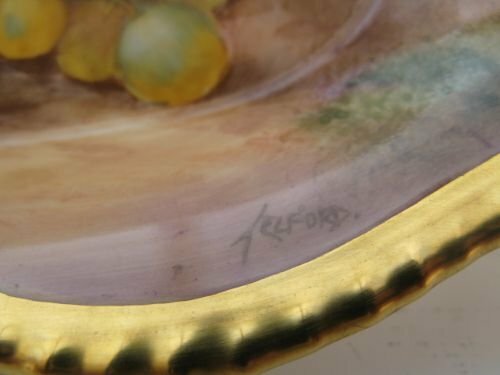 They are in excellent condition with no damage, crazing or restoration and the gilding is bright and virtually without wear. 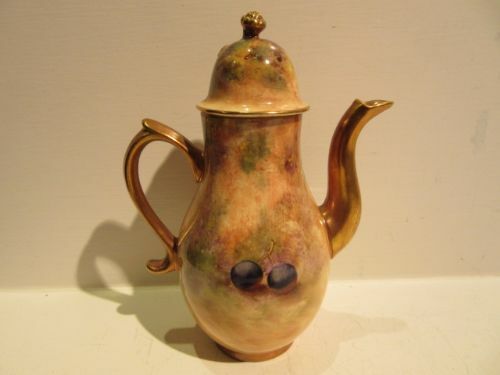 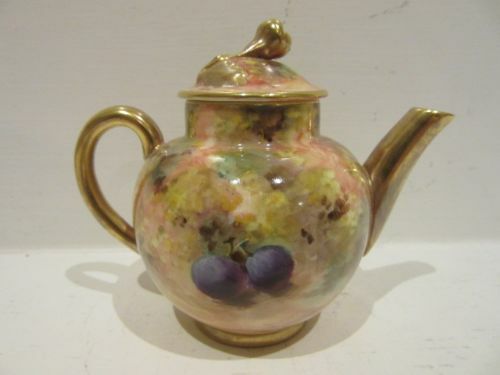 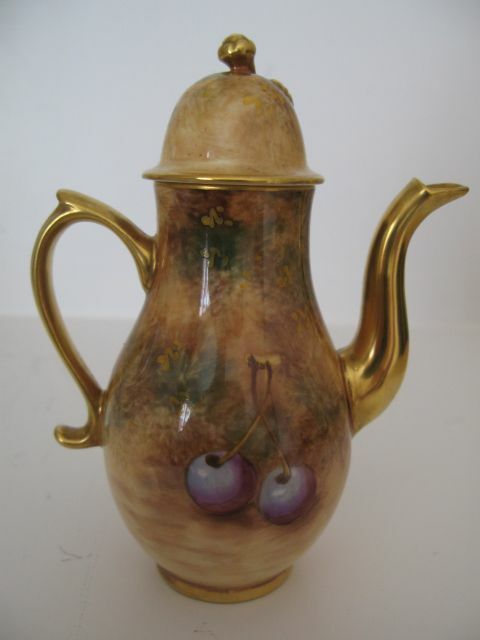 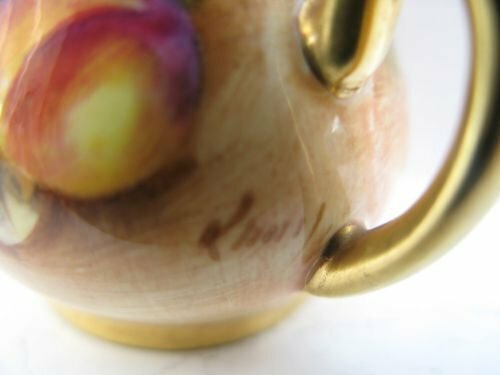 A Royal Worcester Fruit Painted Miniature Teapot By J. Freeman. A good Royal Worcester porcelain miniature teapot, decorated with well painted pears and black grapes against a mossy background by John Freeman. 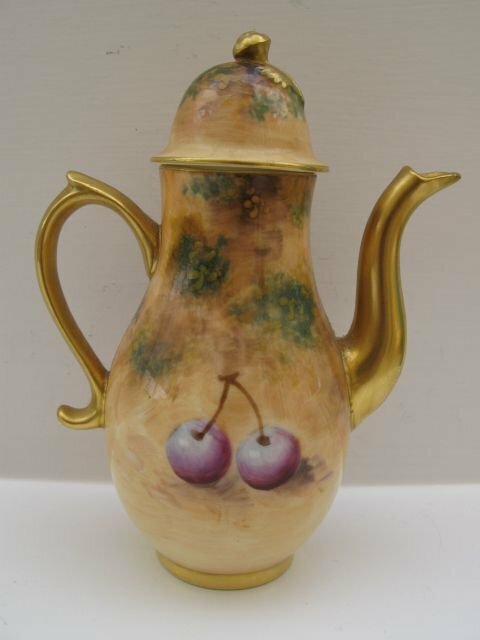 Standing approximately 3.1/8"overall height x 3.3/4"wide over the spout and handle, it has the black factory stamp for circa 1965-1970 and is in excellent condition with no damage, crazing or restoration and the gilding is bright and virtually without wear. 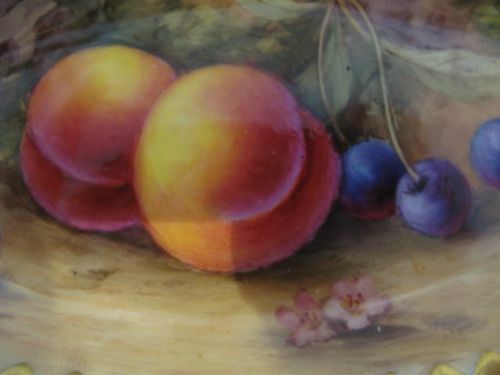 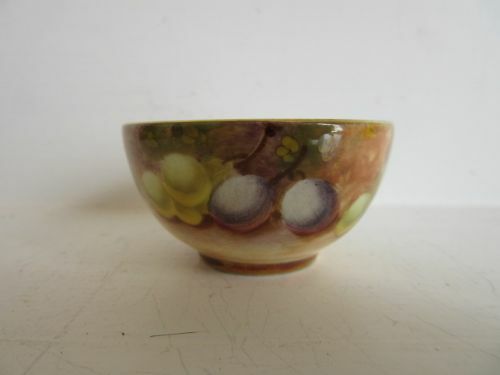 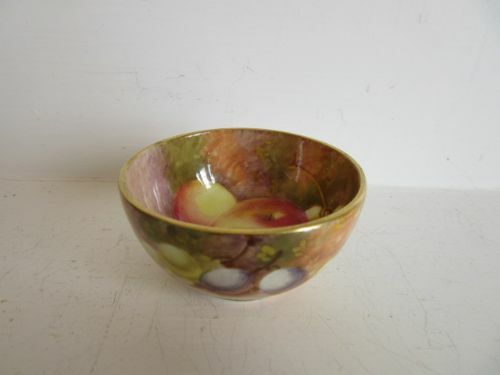 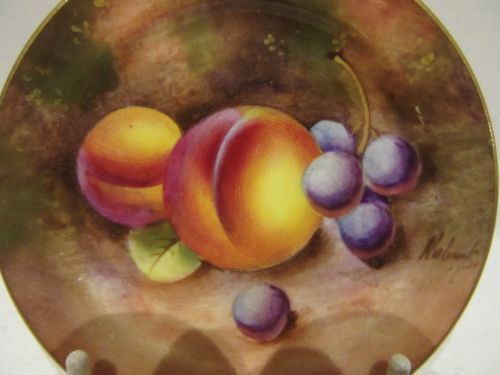 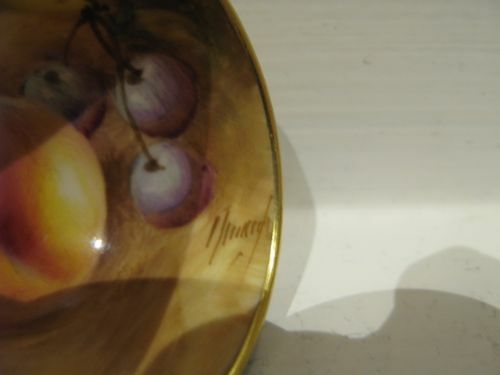 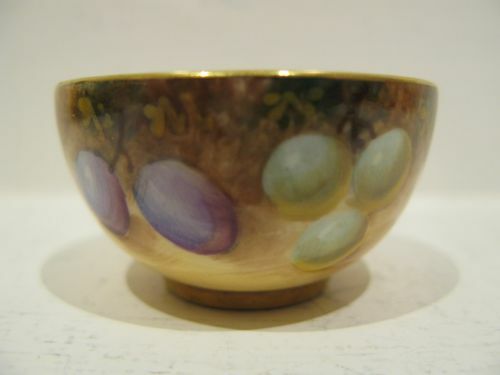 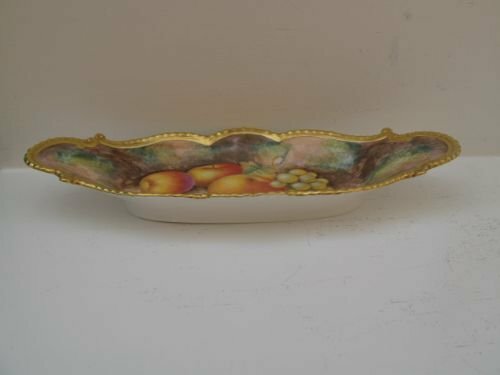 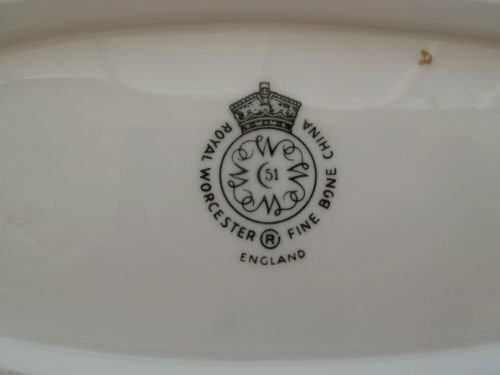 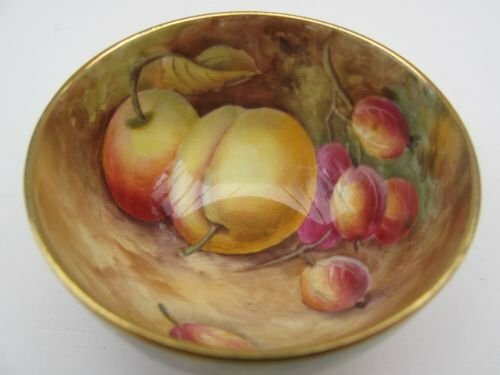 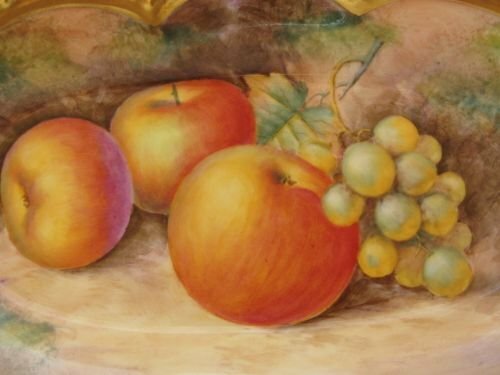 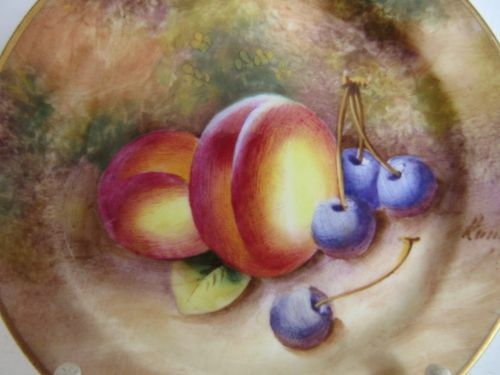 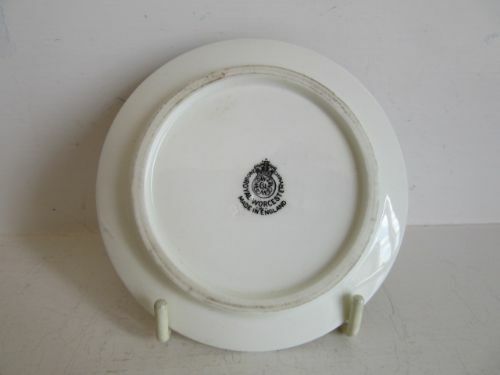 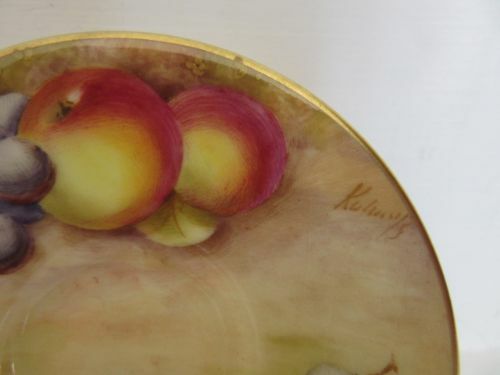 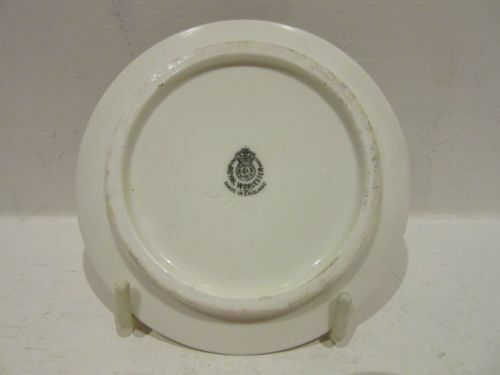 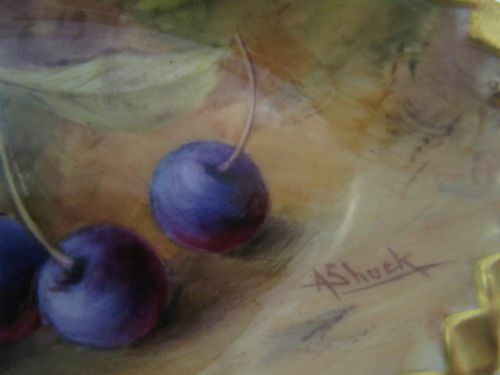 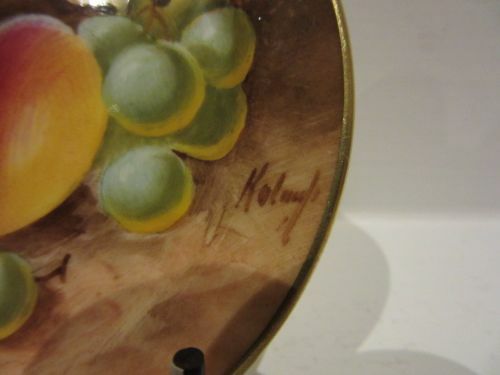 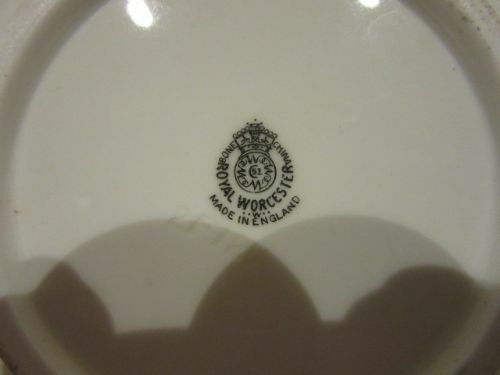 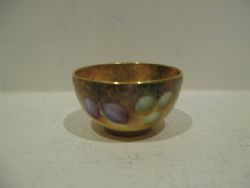 A Royal Worcester Fruit Painted Oblong Dish By Telford. 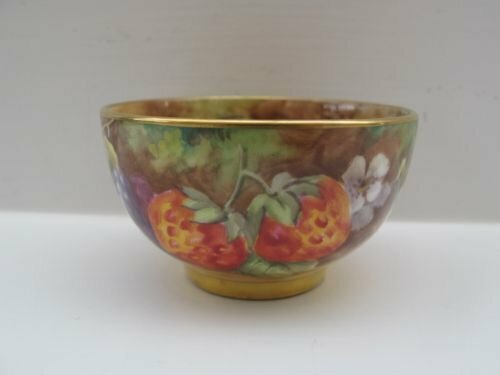 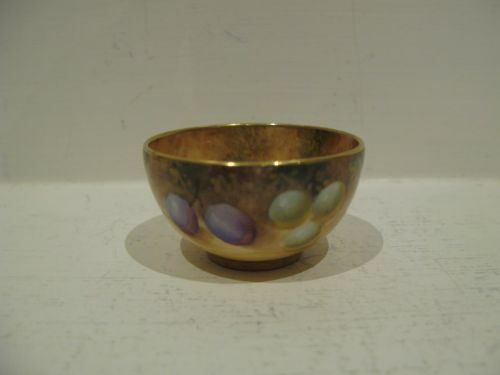 An attractive, Royal Worcester porcelain shaped- oblong dish, with gadrooned heavily gilded rim and painted fruit decoration by Alan Telford. 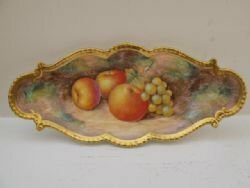 Standing approximately 10"long x 4.1/4"wide x 1.1/4"deep and with the black factory stamp for circa 1970, it is in excellent condition with no damage, crazing or restoration, and the gilding is fresh and unworn. 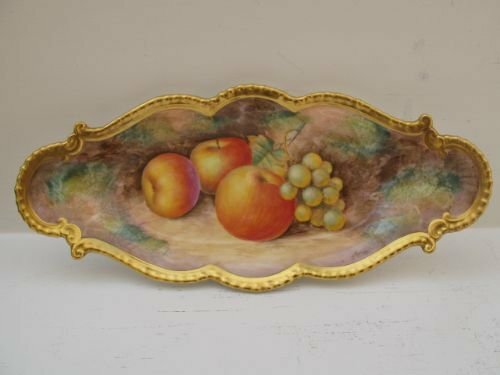 An attractive Royal Worcester porcelain oval dish with heavily gilded pie-crust edge and well painted fruit decoration by Albert Shuck. 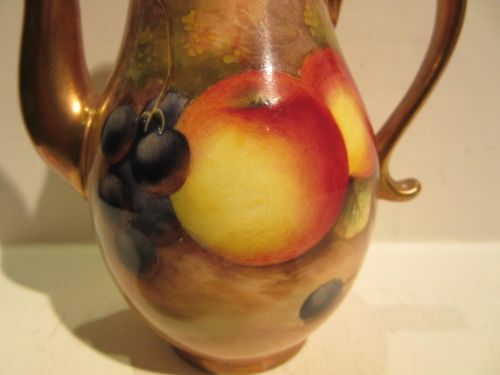 Standing approximately 7"long x 3.5"wide x 3/4"high with puce factory mark and retailers "Maple" mark it is in very good condition with no damage, crazing or restoration and the gilding is fresh and without wear.